Tucked away in British Columbia’s fertile Fraser Valley, Rossdown Farms & Natural Foods is dedicated to providing the highest quality chicken and turkey products. At Rossdown Farms, we like to say that farming is woven into the fabric of our entire family. In fact, Rossdown Farms is the collective result of four generations of poultry farmers. After many years in the industry, we took the knowledge and insight that we’d gained and further expanded Rossdown Farms to include poultry processing. Farmer or Processor? We’re Both. For more than three generations Rossdown has been dedicated to farming, raising and serving the highest-quality poultry products from the Beautiful Fraser Valley. And we’re proud of it! It’s why we are one of the few farms in Canada that do it all – hatch the chicks, feed and grow the birds and then process them in our own facility. This allows us to maintain exceptionally high standards at every stage. 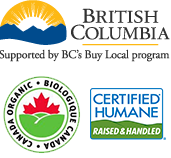 Rossdown Farms is proud to be halal certified by the BC Muslim Association.